This ClipShare mod (patch) currently integrates VideoWhisper Video Conference, Video Recorder and Live Streaming (for ClipShare 4). These plugins extend the video sharing communities with features that really make the difference and just leave other competitors way behind. Video Recorder allows users to record and share genuine on demand videos with their webcams, producing unique original video content. 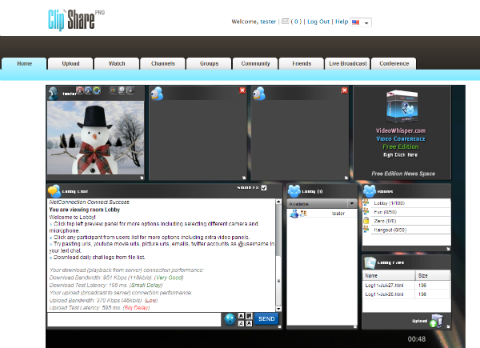 Live Streaming allows users to broadcast live shows from their webcam to promote their profiles and add interactive live video content to the website. These show on their profile page where others can also text chant while watching the shows. All live shows are listed on front page with screenshot. Video Conference turns passive viewers to active participants in live video conference rooms letting them exchange personal opinions, know other members, bond, become website fans and probably revenue generating customers. Modules are part of packages and membership system. Order Webcam Plugins for ClipShare - And see complementary items (optional) in combo offers. 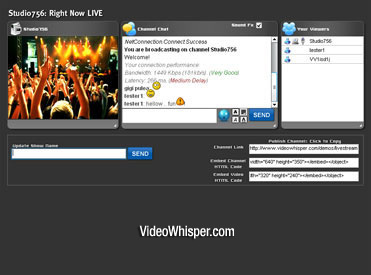 Order Clip Share Single License - If you already have a VideoWhisper level 1 license. See order page for full ordering details and terms related to VideoWhisper items. To see a live demo for this integration, register an account on Cam Clip to see the ClipShare4 mods in action. Use Live Broadcast to stream video instantly and snapshots will show on home page pointing to the user's profile page where site visitors can watch the live video and discuss online. Use Video Conference from menu to access video conference and upload as Webcam to record a video. Before installing, make sure your hosting environment meets all requirements. This requires a rtmp server (Red5 / Wowza / FMIS) in addition to ClipShare requirements. ClipShare needs to be installed and fully functional before installing this. For video recorder to work with current integration, the rtmp server must record the video files to a location accessible by the php scripts. Copy the files from upload folder, including folder structure, to your ClipShare installation (where files from upload were copied on ClipShare installation). After doing this, verify you have new folders live, conference, recorder in your installation folder (usually public_html). Some files will be overwritten (patched) to include new functionality. Import sql/videowhisper.sql (same way you imported sql/clipshare.sql with a tool like phpmyadmin). This will setup tables required for listing live streams and online users. In ClipShare admin area, from Settings > Modules Configuration enable VideoWhisper modules (Video Broadcast, Video Conference, Webcam Recorder). If you're not hosting RTMP with a provider that already supports these applications and knows how to install these (included in the rtmp folder), go to RTMP Application Setup for installation details. A special RTMP application needs to be installed on a supported RTMP server, in addition to web installation. For more details, options and support check VideoWhisper website. In ClipShare admin area, from Settings > VideoWhisper, update VideoWhisper settings. This includes specifying rtmp address (obtained on step 4) for each module and the folder where rtmp server is configured to store recordings (i.e. /opt/red5/dist/webapps/vwrecorder/vwStreams). All applications can share same rtmp address but different ones can be used to apply different settings on rtmp server. This step is not required if you have suPHP enabled. These integrations are based on slightly modified PHP Video Recorder, PHP Live Streaming, PHP Video Conference editions so you can also check that for customizing settings, integration and implementation of other features. Also you can use these editions for updates when these are newer than integration. You will find most files mentioned there in videowhisper folder: videowhisper/recorder , videowhisper/broadcast and videowhisper/conference .